The rise of artificial intelligence will have huge economic implications, disrupting every industry and every member of the workforce. It will create new jobs (2.3 million by 2020, according to research company Gartner) and countless opportunities, but it also has the potential to widen the divide between the haves and have-nots. How can we embrace this technology while creating inclusive opportunities for everybody in the age of Man + Machine? The answer is simple: everyone needs to step up. Combating growing social, economic, and financial disparities will require every individual, business, educational institution and government to play a role in preparing the global workforce to thrive alongside intelligent machines. Government: AI is coming. It’s time to create a game plan. Governments around the world should prioritize preparing citizens for the proliferation of AI. Leaders should create a game plan that addresses the trajectory of job loss by asking difficult questions, including: should we slow down the evolution of technology to buy time to reskill the workforce? We know that certain jobs are going to become extinct. But can we minimize the impact by mapping out the “glide path” and helping prepare workers for new jobs before their current ones reach their natural conclusion? Think about AI like a car. There are two ways that the driver can reach a speed of 200 miles per hour. First, the driver can slam on the accelerator and go from 0 to 200 in matter of seconds. Or, the driver can control the acceleration by gradually applying pressure and monitoring the speedometer. The second scenario is much safer, of course. The same is true when it comes to monitoring the acceleration of AI. Governments should not try to stop its progression. Ultimately, it will make human lives easier, healthier, safer and more productive. However, governments must prepare in order to avoid further widening of disparities between the upper, middle and lower classes. For instance, creating incentives for businesses to reskill or retrain their workers would help people transition smoothly into new roles. This action alone could prevent massive job displacement while fostering innovation. Business leaders: Be culturally oriented towards experimenting, learning and collaborating. There will be clear “dividing lines” between the companies that survive in the future and those that do not. To succeed, business leaders must consider continuous learning part of their DNA and business models. CEOs should invest heavily in reskilling and development opportunities that enable employees to keep pace with job changes and to adapt continuously to where the market is headed. Otherwise their business risks losing its competitive edge. While some companies are already making these investments, such programs are lacking overall. We recently surveyed 300 C-suite and senior executives about their AI strategies. 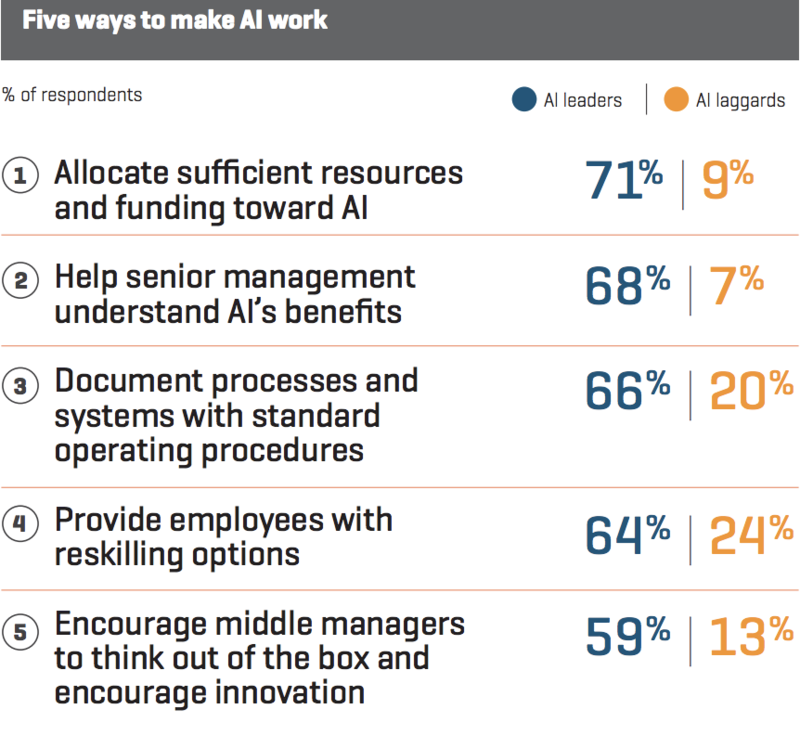 While 82% of leaders plan to implement AI in the next three years, only 38% provide programmes aimed at reskilling employees to work alongside this technology. This needs to change - not just for the sake of individual workers, but for the overall health of businesses. Workers: Take matters into your own hands. As citizens, we cannot simply rely on our governments and employers to help us prepare for the future of work. While the jobs of the future will require more complex and high-value tasks, they will also be higher-paying. For individuals seeking upward mobility and job security, half of the battle will be accepting that their current job is in danger. 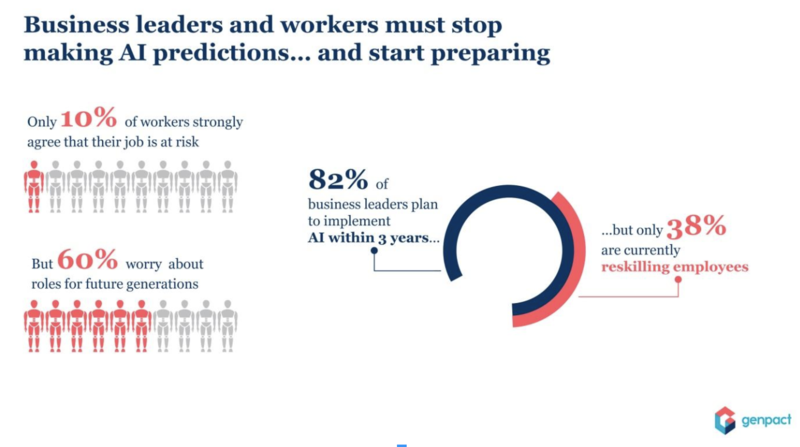 Yet despite the many doom-and-gloom predictions surrounding AI and job loss, only 10% of citizens strongly believe that their job is at risk, according to our research. Interestingly, while many are not concerned about their own job security, nearly 60% of citizens believe that AI threatens the jobs of their children and later generations. This lack of concern for today’s jobs isn’t optimism. It’s naivete, and it could be extremely harmful. We must all be thinking about ways to be proactive about our continuous education. This may mean going back to school, taking part-time courses or even becoming a driving force behind your company’s reskilling efforts. Be willing to experiment, learn fast and collaborate. Be open to new ideas and actively seek out opportunities to learn and share knowledge. Staying curious and nimble will prove crucial.